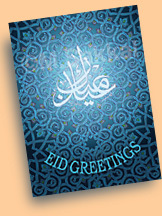 All the cards with the word "Eid" are appropriate for any Islamic holidays, such as end of Ramadan, Adha, Qurbani, etc. 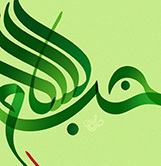 The statement Eid Mubarak means "Have a blessed holiday". Other cards are also appropriate for Muslim and Arab holiday, please review the information about each card by clicking on the card image below. These designs are available as a greeting cards size 4.675"X6.25" for order No. ending with SG, folded with blank space inside so you can write your own greeting message. At back of each card the transliteration and meaning of the phrase are included. Not all designs are available in all formats. Eid ul-Fitr takes place at the end of the fasting month of Ramadan. Eid ul-Adha takes place at the end of Hajj (pilgrimage) to Mecca. The exact Eid dates may be one day different from the above since they are confirmed by observing the moon of the new Hijri month. The price for a minimum order of one pack of 10 Greeting Cards with white matching envelopes in crystal clear sealed bag is $15.00. You can mix and match any designs in your order. If you order some cards as a gift to be shipped directly to another address, we will be happy to include a card stating "Compliments of your name". Please send an e-mail message to mamoun@sakkal.com and tell us if you want this service. Online: Order by secure server online HERE. Please write the Order No. and quantity of the card designs you like in the "Note to Seller" field at the end of the order form. The online order form does NOT show these numbers again. Please make sure to include your phone number information. If you have any questions please call (425)483-8830 or fax (425)483-9707. Orders are shipped within 24 hours except for items on backorder, most orders ship same day. Two day Express Delivery in the US is available for an additional charge of $14.00 for one to ten packs within the continental US For information about express delivery outside the continental US, please call us at 425-483-8830. Express delivery outside the US takes usually 4-5 business days excluding customs, and costs an additional charge of $26-39. The greeting cards sell usually for $2.00 -2.25 each, or $20 -22.50 per pack. Buy some to raise funds for your organization, or to educate and connect your community to its heritage. These greeting cards are designed and produced to the highest quality standards, and are sure to impress your audience. If you want to order some cards for your upcoming event, or to send for next Eid, please do that soon to make sure you will get them in time. Some designs may sell out, and some production time may be required to fulfill large orders . A message can be printed on the inside of the greeting cards for an additional charge of $75. For ordering details please click here. in the [Special Handling Instructions] field. The online order form does NOT show these numbers again.